There is a difficult distinction between an invoice and a bill. Quite often they are used interchangeably in the English language, as either term is often acceptable. But there is an actual distinction. So, in some contexts, invoice is used as a synonym of bill; in other contexts, invoice is used to mean a document that contains a list of goods or services and the bill, but it contains also other specific data that are required by specific laws/regulations. This distinction is confusing but, for the purpose of your business, let’s consider an invoice and a bill the same. You might even decide to use one term more often than the other, or completely ignore one of the terms to erase any doubt about what you mean. Quite often, it is the game of semantics that tough customers use to get out of paying on time – or not paying at all. When it comes to your business, it is not important to how it is referred only that you get paid. For the purpose of this article, we will use the term invoice and bill interchangeably. When you send out bills on time, you get paid on time. The most important aspect of billing is that you have a process in place that ensures your goods and services are valued and given their due payment. When you employ the expertise of a quality printing and mailing service, you are becoming a part of a profitable process. For those of us who have had the misfortune of trying to implement and operate a billing process in-house, we recognize that it is difficult. Day-to-day operations are a difficult process in themselves. Very rarely does a full day go entirely by plan. One of the dozens of issues could pop up and wreak havoc when it comes to sending out your bills in a timely fashion. Equipment malfunctions, personnel issues, and weather are just a few examples of what can cause you to stack a few papers on top of your ever-mounting “to-do” list. Billing delays that lead to delays in payments received are never good for cash flow. When you outsource your billing process to the correct printing and mailing service, you erase your own accountability and pass it on to a professional. This adds a level of accountability that you may have been missing. Are you tired of losing a client’s address, phone number, or any other pertinent information? Having that information is now a concern of the past. You can enter your client’s data directly into the printing and mailing software and it is stored safely. With safely stored and secured data, you now have a central location for all of your client’s information. You don’t have to scramble around searching for information. When it’s time to invoice or contact your client, it is taken care of. Billing through a printing and mailing service is also a big money saver. You’re eliminating the cost of machines, paper, ink, postage, and the personnel responsible for billing. Previously an employee had to be responsible for manually filling out bills. Billing also required tasks like filing, scanning, and organizing accounting paperwork. Consider how all of this time could be better spent for your business. How would you use it? Would you offer each customer an extra level of attention? Would your new time be better spent on acquiring new business? How about finally fixing some things around the office? The choice is yours! Time is money so, with the employment of a professional printing and mailing service to handle your billing needs, you are freeing up time, money, and other valuable resources to out a focus on what you love – and less on what you need to do. One of the most beneficial features outsourcing your billing process to a printing and mailing service is that you are now a part of a standardized process. This means that your services and goods are accounted for, bills are sent out in a timely manner, and you can expect to be paid in a timely manner. When you are dealing with your company’s finances, it is imperative that you take out as much guesswork as possible. Humans are visual creatures and when you present your customers professional looking invoices, they are more apt to take notice. A reputable printing and mailing service offers you the opportunity to increase the credibility of your brand through the products that printing and mailing is able to provide. You just cannot produce the level of professionalism that they are able to generate – and you shouldn’t have to. It is their job – they have the equipment, expertise, and experience needed to provide you what you need to get you paid on time. On top of that, you have the opportunity to personalize your bills with logos, messages, or anything else you feel is necessary to increase your brand. Make no mistake about it, the modern office is mobile. As technology improves, so does the freedom of the business owner. You can make calls, live-chat, make sales, resolve issues, bill out customers remotely, and so much more! This is a wonderful feature of the times in which we live but offers additional pitfalls. Many of us thrive on routine and, when that routine or setting is disrupted, so is our process. If you are accustomed to operating in a certain way, a change of scenery could be hurtful in the beginning – at least until you get used to your newfound freedom. A professional printing and mailing service solves for this issue by doing all of the work for you. All you need to do is upload your information anytime you feel like it. This means 24 hours a day and seven days a week, from the beach to the bedroom, you have the freedom and ability to live your life as you see fit! 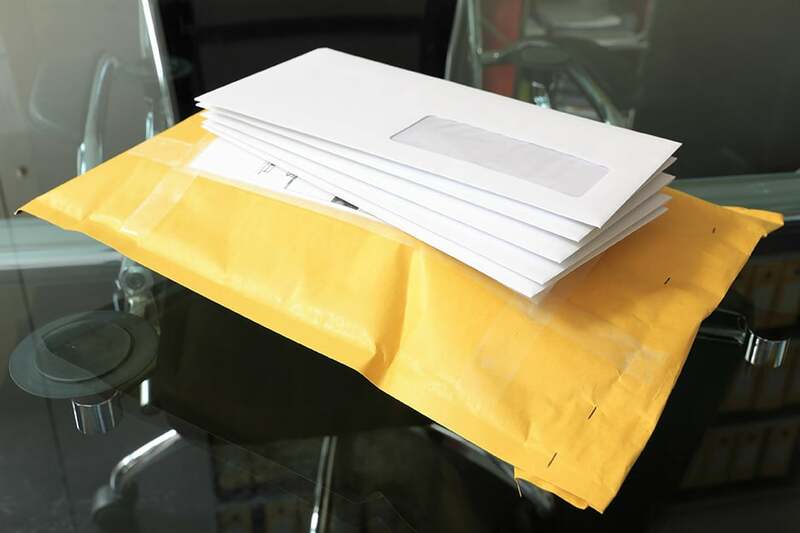 A proper printing and mailing service, such as Town Mailer, can take your uploads and have it printing, folded, stuffed, and in the mail in 24 hours. Talk about freedom to operate! As to your customer, you do not want them to get behind on payments due. When you automate your billing process through the capable hands of a printing and mailing service, you are helping them, as well as your business. Good customer services through good communication and streamlined billing is as good as it gets. Good business is reciprocal. It is a two-way street. If your customers can count on you to offer them timely communication and billing, you are more likely to count on them to pay you on time. When you outsource your billing process to a professional printing and mailing service, you are eliminating roadblocks that can be used as reasons (or excuses) to not pay you on time. Complicated invoicing procedures don’t just slow down the payment process, they also mean complicated work for your accountant. Billing through a printing and mailing service provides a standardized regularity when it comes to billing. For one thing, your accountant will no longer have to decipher your handwriting. There will be no chasing you down for a signature. No badgering the team for necessary paperwork. No more combing through stacks of papers. No more trying to determine which payments are paid, pending, or overdue. Don’t have an accounting department? Even better. When you put this valuable process into the hands of a printing and mailing service, such as Towne Mailer, you are freeing up the most valuable form of time – your own! Should you see any benefit in the above points, it is time to consider outsourcing this process to the pros. If you see the benefit but it may not exactly pertain to your business, keep in mind that printing and mailing is not a one-size-fits-all solution – it is scalable, customizable, and adaptable to you and your needs. Towne Mailer has been a one-stop solution for customers for nearly two decades. Besides billing, Town Mailer is a true printing and mailing service that is able to offer its clients many pieces to the puzzle of their success. Have questions? Reach out to us today and let us show you how we can be of service.